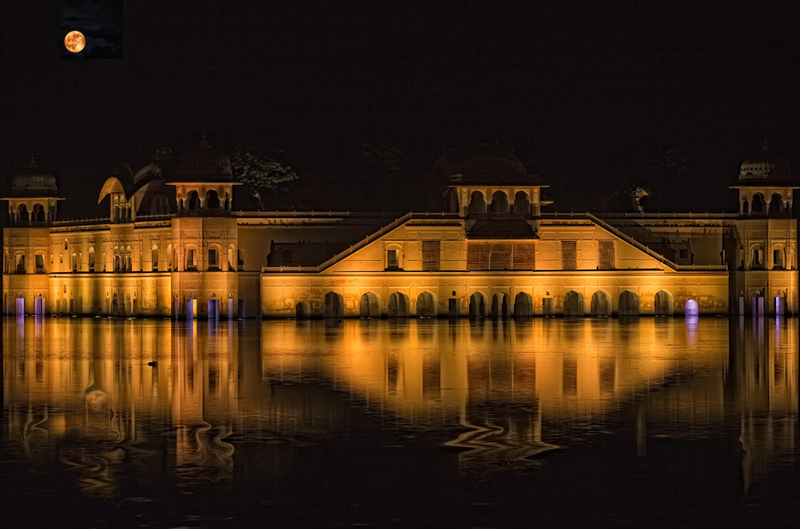 Jal Mahal is a palace located in the midst of Man Sagar lake in Jaipur, Rajasthan. In the past, at the location of the lake, there was a natural depression where water used to accumulate. During 1596 AD, when there was a severe famine in this region there was consequent acute shortage of water. The then ruler of Ajmer was, therefore, motivated to build a dam to store water to overcome the severe hardships caused by the famine to the people inhabiting the region. A dam was constructed, initially using earth and quartzite, across the eastern valley between Amer hills and Amagarh hills. The dam was later converted into a stone masonry structure in the 17th century. The dam, as existing now (see picture), is about 300 metres long and 28.5–34.5 metres in width. It is provided with three sluice gates for release of water for irrigation of agricultural land in the down stream area. Since then, the dam, the lake and the palace in its midst have undergone several rounds of restoration under various rulers of Rajasthan but the final restoration in the 18th century is credited to Jai Singh II of Amer.